England manager Roy Hodgson has singled out Gareth Bale as the major threat possessed by the Welsh national team at the Euro 2016. The world’s most expensive player has managed to help his national team qualify for their first major tournament since 1958. The national team has struggled to reach a major tournament in all these years despite having some great players like Ryan Giggs. Hence, achieving qualification was always going to be the main priority for Chris Coleman. The manager managed to take full advantage of Bale being in his prime. Tottenham Hotspur is a club with a rich heritage of nurturing some of the finest English footballers to have played the game and the new generation of Spurs starlets are set to continue that tradition. Ever since the great Spurs teams of the 1960s saw the likes of Jimmy Greaves take his astonishing club form and turn it into goals for his country – 44 of them in total - fans have become accustomed to seeing their club’s stars strut their stuff for England. Roy Hodgson says that he is remaining confident about the fitness of midfielder Michael Carrick ahead of the Euro 2016 qualifying match against Estonia. The England national team can complete a miraculous turnaround following a disappointing World Cup if they reach the Euro 2016 with several games to spare. England have won all of their qualification matches so far and are now seen as strong favourites for the title. Can Man United end FA Cup drought? Between 1993/94 and 1998/99, at the peak of Manchester United’s powers under Sir Alex Ferguson, the Red Devils graced the FA Cup final four times in the space of six years – claiming three successes. Since then, in the 16 years that have followed, United have trodden that path just three times. They have come unstuck on two of those occasions, with their last success coming in 2004 – away from Wembley as they proved far too strong for then-Championship outfit Millwall at Cardiff’s Millennium Stadium. Read more about Can Man United end FA Cup drought? Republic of Ireland manager Martin O’Neill claims that his England counterpart Roy Hodgson is putting unfair pressure on Aston Villa midfielder Jack Grealish over choosing to play for England rather than Ireland. Grealish is seen as yet another hot prospect in British football, but he is eligible to play for either England or Ireland. So far, he has featured in all of the games at youth level for the Ireland team. Naturally, his senior call-up should also be with the Ireland senior team, but Fifa rules allow the player to switch between nationalities at the time of being called up for the senior squad. Patrick Viera, Thierry Henry, Ian Wright, Tony Adams and Pat Jennings are just a few of the players that are mentioned whenever people start talking and debating about which player has been the best one who has worn an Arsenal jersey. Thierry Henry is generally considered to be the best one as the retired Frenchman helped Arsenal on winning big pieces of silverware by making a total of 254 appearances and scoring 174 goals during his playing career with the Premier League club. However, according to the former Arsenal player Paul Merson, considers Dennis Bergkamp to be the greatest player to have performed for Arsenal. Wayne Rooney is one of the best strikers to feature in the Premier League and will lead the line for Louis van Gaal's side this campaign. The Red Devils, who lifted the title back in 2013, finished fourth last term and will be aiming to finish at the top of the division for the 20th time in their illustrious history. 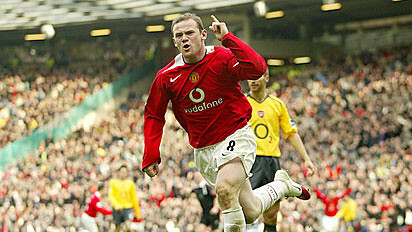 Rooney, who is United's captain, could play a key role in their success this season. He will be looking to emulate his individual performances from the 2009-10 and 2011-12 seasons when the England international scored 26 and 27 league goals respectively. What price a familiar face coming back to haunt Manchester United? Back in 2012/13, Sir Alex Ferguson’s final Champions League campaign at the helm of Manchester United was brought to an abrupt halt by Real Madrid at the round of 16. The man to deliver the knockout blow was one Cristiano Ronaldo, with a former Old Trafford favourite returning to his old stomping ground to dash the dreams of those who once idolised him. A similar story could be about to unfold in 2015/16. We are not talking about club icons here, but United will be all too aware that familiar faces could come back to haunt them on European football’s grandest stage. Read more about What price a familiar face coming back to haunt Manchester United? The England senior team may benefit from Manchester United defender Luke Shaw being left out of the England under 21 team for the upcoming European championships. Harry Kane appears to have confirmed his breakthrough into the England senior team after featuring in back-to-back matches towards the end of March.